What will happen if a lead is already in the hopper and it dialed the inbound line? The Outbound Settings Tab within the campaign settings has arguably the most important settings within the system. Here you will set your dial method (power dial, preview, predictive), your dial level (how fast you will dial) and be able to put in thresholds to help control your drop rating among other things. These settings are truly the key to your success. In the campaign settings page, go to the Outbound Settings tab. This is the content of the Outbound Settings page. Dial Method is the first toggle. This will change the way the system calls out or if you wish, to have inbound only. These are the different methods that you can select. Inbound Only - Agents can only do Inbound and Manual calls. Preview Dial - At the end of a call, agents are able to see the next lead in the list. It is up to them when to make the call and they may also be able to skip to the next lead on the list. This can be ideal for more complex sales where a bit of research is required between calls to increase the chances of success. This can also be set to Preview and Inbound which allows inbound calls to a Preview Dial campaign. Power Dial - The system automatically dials the Leads based on your desired calls-to-agent ratio. Predictive Dial - The system automatically dials the Leads based on your desired calls-to-agent ratio against your drop call percentage. Dial Timeout is when the campaign will move on to the next call if there is no answer. We recommend a dial time out of 6-7 as most answering machines will pick up by the 6th ring. Place Calls For Agent While On Call is when the campaign will call regardless of agents on ready status. This is popular for accounts that have more than 30 agents so the campaign can call, nonstop. This is a powerful, but dangerous setting. If not managed correctly, this setting can raise your drop rating astronomically. Drop Lockout Time is used for the leads that are called. 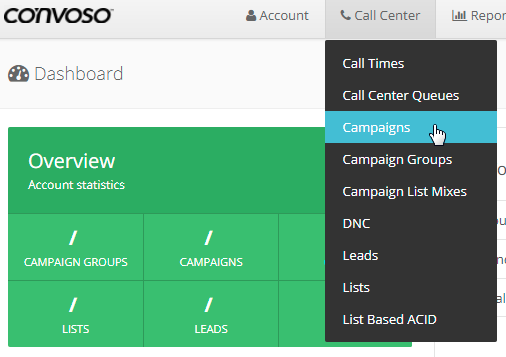 It forces the campaign to not call on a lead for a specified amount of time if the last contact was a dropped call. Hopper Priority Call Order is to make sure the order of the leads that are set by "Priority" (usually inserted by API) will be assigned in the hopper in ascending or descending order. Please note: This setting will not effect all leads, only leads with a priority level set on them. Dial Level Difference Agent Target will remove agents out of the equation of (Agent X Dial Level). You can disable or enable this feature to unlock the next toggle which is Agent Target Value. Agent Target Value will exclude agents from the dial level calculation. This is used so that it will dial lower than the number of agents that are ready for your campaign. For example, if you have 5 dial level and 5 agents, that would be a total of 25 calls at max. If you exclude 1 agent, it will call 20 calls instead. Dial Threshold will change the Dial Level based on how many agents are on ready in this campaign. Dial Level Kill switch will stop calling when everyone is on a call. This means that when everyone is on a call, the campaign will stop calling new calls. If the campaign was in the middle of making calls, those will finish and will wait till an agent is on ready.